Burning Moon's Inside advice: Carlson Quilt Fabrics Giveaway & Review! I absolutely love my current purse, I have a black batman bag that I take with my everywhere. My fiance bought it for me two years ago for Christmas to replace the beaten down batman bag I had before that. I use this bag day in and day out the only problem is the inside is just one giant pocket which I don't mind but it doesn't like to hold a lot of weight and feels like the strap will snap if I want to carry all of my things. Next weekend we are going on vacation and I wanted to find a bag that will be able to endure all of my normal daily items plus the extras I will be bringing along with us so I began looking around. The company that caught my eye is an etsy shop called Carlson Quilt Fabrics who sells a mixture of fabrics by the 1/2 yard along with purses, bags and pillows! Looking at their shoulder bags they seemed pretty sturdy and quite roomy. Looking at the various bags I really liked both the Nightmare Before Christmas Gray & Black Embroidered - Quilted Shoulder bag and the Disney lilo & Stitch Fabric Quilted Cross Body Messenger Bag, I couldn't decide which I liked best so I asked the shop owner to surprise me and sent which ever would be easiest for them. I was extremely surprised when I arrived home to find a big fabric shipping bag on my front porch, once I got inside and was able to open it I was very surprised to find not one but both of the bags I really liked from Carlson Quilt Fabrics inside and I really like that they were both inside of their own bag in the bag in case anything were to happen to keep them still dry and safe. I don't think this review will be able to capture how much I truly love these bags, I decided to test out the Jack back first to see how it would hold up to all of my stuff while on vacation and holy cow this bag is ten times better than I could have imagined. This bag is quilted, yes you read that right it is a quilted shoulder bag I've never owned one before and I wish I had. This bag is very sturdy and thick, you won't get a pen poking a hole in the corner of this bag! Not can it stand up to a lot of weight as you can see above with my water bottle, large weekly binder, first aid kit, hand wipes, keys, wallet and more it has eight pockets, two outside and six inside. There are so many details to this bag that it is almost crazy even the inside pockets are lined with black and white polka dot ribbon, the outside is black fabric with Nightmare Before Christmas fabric layered on top plus Nightmare Before Christmas ribbon details and a hand embroidered Jack on both sides of the bag. The straps are long, thick and are comfortable on your shoulders, the whole bag zips up to protect your belongings and the bag has a hard bottom to keep it standing on it's own without falling over. This shoulder bag costs $48 and it is worth every single penny you spend on it. Needless to say this bag will be going with me on vacation and will be my purse for quite some time. Sometimes when I am out I want to bring a big bag but other times I might want something smaller than the purse I normally carry which is where the Stitch Cross Body Messenger Bag comes into play. It has two zippered pockets and is about half the size of the Nightmare Before Christmas bag but still just as amazing. The inside of the bag is lined with a cute blue floral fabric that really goes with Stitches vibe. The bag itself is pretty thick and the strap is really nice, strong and doesn't dig into your shoulder. This bag is perfect for when I only feel like bringing my camera, wallet, phone and keys without lugging everything else with me. The smaller cross body messenger bags are $38 and again well worth the cost because not only are you paying for something that looks adorable but it is extremely well made and you can tell the creator puts a lot of thought, effort and love into their products that will last you for years to come. 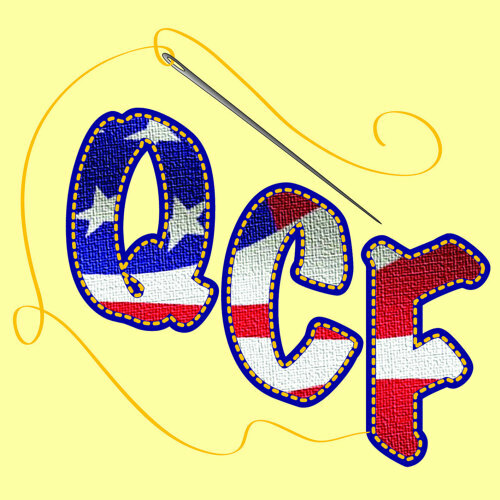 From start to finish this shop is fantastic and has been one of my favorite shops to work with I highly suggests you go visit them the next time you are looking for a new bag, quilt, pillow or fabric. 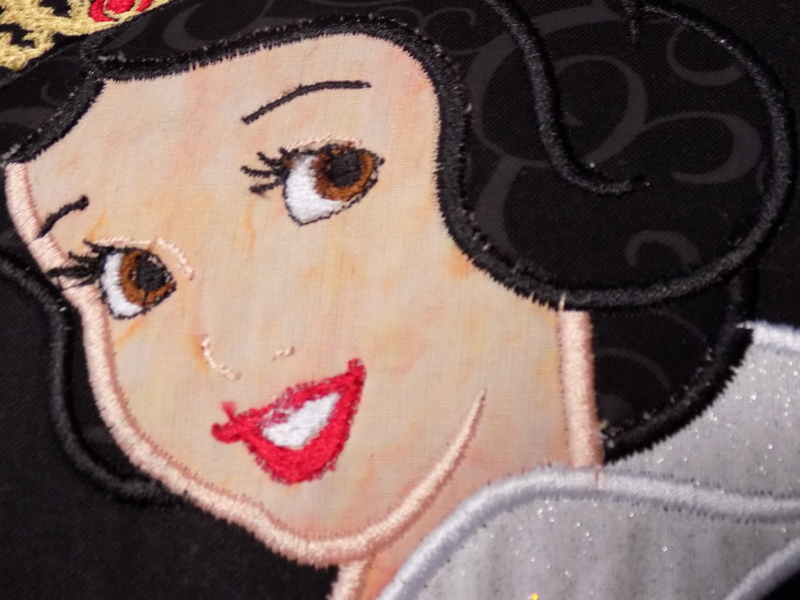 One of my readers is going to win this darling Snow White hand embroidered decor pillow (12" x 16") shown above. I love so many things. The retired Hawaiian is so awesome. We love Minions so the minnion Easter Bunny is awesome. I love the Sea Turtle bag to. I really like the OOAK Peanuts Characters Fabric, Charlie Brown, Snoopy Embroidered Quilted Handbag, Shoulder Bag, Tote Bag. Thanks. I like the Black Pre Quilted Butterfly- Spring Embroidered Hand Bag - Shoulder Bag - Tote Bag. It would be perfect for my sister. I love the Secret Life Of Pets Max & Duke 24" x 44" L Blue 100% Cotton Quilt Panel, My daughter would freak out over this. I love a purse with pockets and these have them. One item I really like is the OOAK Purple Paisley Pre Quilted Handmade Shoulder Bag/ Tote Bag/ Hand Bag. And I love that these are quilted. I really liked the Bad Apple Snow White Decorative Pillow. They have so many, but my favorite is the "Good to be Queen" . I like the Harry Potter lap quilt! Disney Princess Sketch Black & Pink Quilted Cross Body Lined Messenger Bag - Tote - Shoulder Bag is so pretty! I really like the New! Disney Mickey Mouse Comic Fabric Quilted Embroidered Shouderbag - Tote Bag - Hand Bag! I really like the BB-8 tote bag. I like the Eiffel Tower quilted bag. I also like " OOAK - Disney Pinnochio Panel Cotton Baby Quilt with Pinocchio Embroidery"
Another product I really like is the OOAK African Elephant Pre Quilted Embroidered Hand Bag.